Oil drilling has traditionally focused on the biggest reservoirs, leaving smaller pockets unexplored. A new "mole" drill being developed by SINTEF Petroleum Research, however, could exploit what is believed to be a significant resource, says project manager Jan David Ytrehus. Jan David Ytrehus shows the tooth marks made by the new drilling tool in a cement model of a well. Credit courtesy of SINTEF / Thor Nielsen. SINTEF's MiNaLab in Oslo, Norway. Credit courtesy of SINTEF. Jan David Ytrehus looks through the transparent Plexiglas part of the well model. Credit courtesy of SINTEF / Thor Nielsen. The potential for oil production from small reservoirs remains unrealised as experts believe they are too expensive to drill using existing technology. 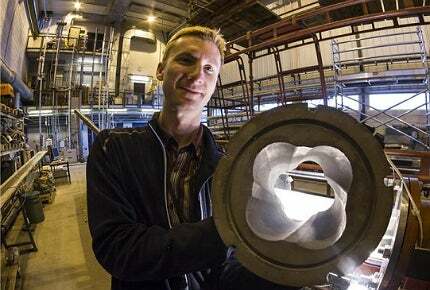 But scientists at SINTEF Petroleum Research are developing a new tool, based on ‘Rifle Well Technology’ that could unlock thousands of these oil-filled pockets on the Norwegian Continental Shelf, all the while cutting costs and improving efficiency. Once complete, the tool, dubbed the "mole", will have an extra row of "teeth" compared to conventional drills, to create spiral grooves in the well for extended reach drilling and better cleaning of the wellbore. Designs are still being ironed out, but SINTEF’s Jan David Ytrehus believes the new drill, when used in small reservoirs close to existing wells, could enhance recovery rates and provide added value to the oil industry. Sarah Blackman: Where did the idea for developing a new drill for exploring small pockets of oil stem from? "Once complete, the tool, dubbed the "mole", will have an extra row of "teeth" compared to conventional drills." Jan David Ytrehus: The key here is the Rifle Well technology. We have investigated the effects of introducing helical grooves in a well bore and this provides a significant improvement in cuttings removal and reduces friction between the drill string and the formation. The improved cuttings removal allows us to clean out the bore hole with a lower dynamic pressure. This concept is validated in our laboratory and the results show that better hole cleaning is achieved when grooves are introduced in the wellbore wall compared to a conventional circular wellbore. SB: Why is there a sudden interest in exploring small oil-filled pockets? JY: Some of the fields in the Norwegian Continental Shelf are quite old now and at a certain point installations need to be replaced or there will be a liability. So, it would be a good idea to exploit the pockets nearby existing installations while they are still useful for this. SB: But doesn’t it cost more each time you drill into a new well? JY: Not necessarily. If you could go in with light rigs and through tubing methods, this doesn’t necessarily need to be too costly. It can be done at a fraction of the cost of using a large rig. You start more or less at the end of your existing installation and go from there. SB: What kind of life-cycle do small pockets of oil tend to have? JY: The time-to-produce a small pocket can be down to a couple of months. This means that reducing the cost of drilling is vital to make this profitable. SB: How will SINTEF’s mole drill improve efficiency and cut costs when drilling for oil? JY: There are two things that are important here. One is to lower the overall cost of drilling which is one of the main cost drivers when developing an oil field. "The improved cuttings removal allows us to clean out the bore hole with a lower dynamic pressure." So, if you go into an existing well after several years of production and when production has slowed, if you could prolong the well into the next section – which in itself is not big enough to defend new installation from the seabed with rig costs and full infrastructure – then you provide access to a lot more oil and gas. The other thing is; if you are able to drill with lower dynamic pressure you can reduce mud-loss problems when you are drilling through an already-produced reservoir. When you have produced for a while, the pressure in the reservoir will go down – you are removing mass. SB: When do you plan to introduce the tool to the market? "The new drill, when used in small reservoirs close to existing wells, could enhance recovery rates." JY: This is a little bit up to the market. This tool that we are developing is useful for several applications, so which application [it will be used] for first isn’t completely decided yet. Some uses are easier than others, although the overall potential is creating a non-circularity in the well bore for extended reach drilling and improved well performance. One application is section milling. When you are plugging a well for abandonment for life-cycle reasons, on the Norwegian Continental Shelf it is a requirement that you should have 100m of documented good cement between reservoir zones and the seabed. When you have a steel casing with cement in the annulus it’s not that easy to guarantee that you don’t have cracks, so you have to mill out all the steel and concrete and go down with fresh cement. This is very costly, so one feature with the mole tool is to go down with electric cables and mill out with active rotational side-cutters. SB: How have you tested this design to see how it would work? JY: We introduced the Rifle Technology as a concept and then we faced the challenge of making the Rifles. So we came up with a conceptual design and we got verification projects for the Rifle Well and we have done a technology validation on this concept. This phase is soon to be wrapped up. The tool, as a separate development is conceptually designed. We know that it can be made, but we do not have a prototype that we have tested in the well. There is a lot of detailed engineering to be done now. As investment in the UK North Sea hits record levels, companies fear an industry skills shortage could be the biggest barrier to future growth. Forecast spending for 2012 has been lowered as government officials confirm the UK will pull out of Afghanistan by 2014.As new offshore leases become available, experts are sounding the call for improved disaster oversight.